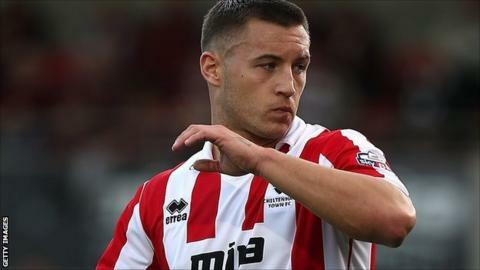 Cheltenham defender Lee Vaughan says he is "proud of himself" after forcing his way back into Gary Johnson's team. Vaughan, 29, started his first game since 14 April and helped Cheltenham defeat Macclesfield 2-0 on Tuesday. And now he says he wants keep his place as Cheltenham's rise up the National League continues. "I just want to kick on," Vaughan told BBC Gloucestershire. "I'm not the type of person to hang around and pick my money up." He added: "I've earned my money tonight (Tuesday) and I haven't done that for five months. I'm proud of myself for getting back into the side. "There were times when I didn't see a way back but the manager has been true to his word and said he will pick his best players and I'd like to think I'm one of them." Vaughan revealed how at one point he thought he was being substituted only to remember he is playing with a new squad number this season. "It was a tough night for me but I'm chuffed to bits I've got through unscathed," he added. "When I saw the number two go up, I had a walk over but then realised I'm not number two anymore and had a walk back. I was glad to stay on."